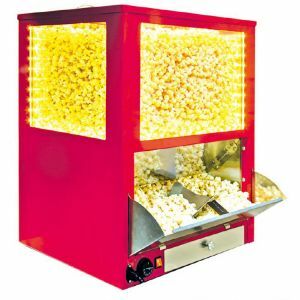 Bulk Popcorn Display Warmer, with autofeeding (the autodrinker's concept). Popped corn is loaded from above to fill the whole cabinet. The warmer holds nearly 100 /46oz. cups. All the four walls are made of glass with LED lighting over the whole glazing perimeter. The cabinet is silver metallic painted. The warmer can be placed both on the back and front counters. The deck is heated, the forced hot air convection keeps the popcorn fresh, crisp, and not overdried. Bulk Popcorn Display Warmer, with autofeeding (the autodrinker's con cept). Popped corn is loaded from above to fill the whole cabinet. The warmer holds nearly 100 /46oz. cups. The warmer's four walls are made of glass. LED lighting over the whole glazing perimeter. The cabinet is red painted. The warmer can be placed both on the back and front counters. The deck is heated, the forced hot air convection keeps the popcorn fresh, crisp, and not overdried. 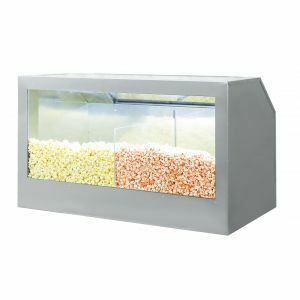 Bulk Popcorn Floor Display Warmer, one compartment, with a lighting. Adjustable temperature +30/+85*C. The glass window is packed separately for transportation. 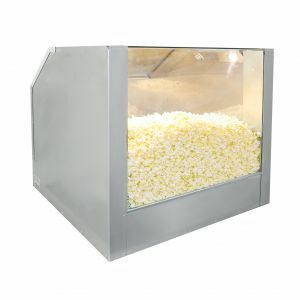 Bulk Popcorn Floor Display Warmer, two compartments, with a lighting. Adjustable temperature +30/+85*C.
Bulk Popcorn Floor Display Warmer, two compartments, with a lighting. 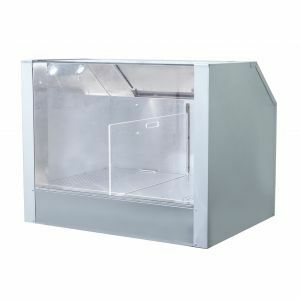 Adjustable temperature +30/+85*C. The glass window is packed separately for transportation (inside the warmer). 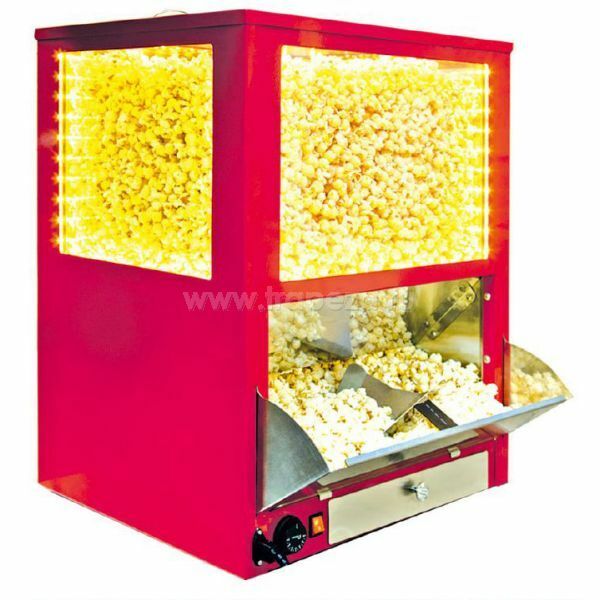 Bulk Popcorn Floor Display Warmer, three compartments, with a lighting. Adjustable temperature +30/+85*C. The glass window is packed separately for transportation (inside the warmer). 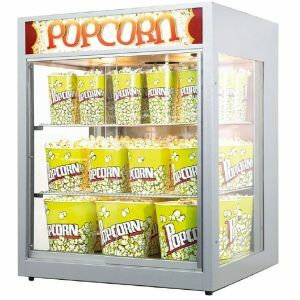 Bulk Popcorn Display Warmer, with autofeeding (the autodrinker's concept). Popped corn is loaded from above to fill the whole cabinet. All the four walls are made of glass with LED lighting over the whole glazing perimeter. The cabinet is silver metallic painted. The warmer can be placed both on the back and front counters. The deck is heated, the forced hot air convection keeps the popcorn fresh, crisp, and not overdried. 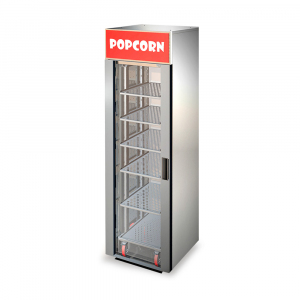 Stylish and modern display warmer will fit into your concession area design easily.Cabinet made of stainless steel. There is a light box with removable media. Staff member refills warmer from back side; customers have front side access at any time. 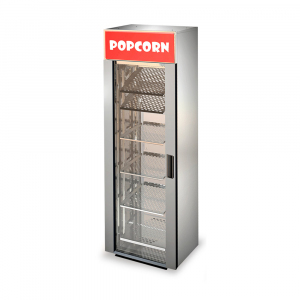 Shelves can be placed either horizontally for popcorn, or can be tilted for nacho trays.Internal temperature from 30°C to 70°C. Due to equal convection of warm air along both sides, whole volume is heated evenly even with full load.